It’s the return of the amineko! Actually, it’s a bit of a sad story. 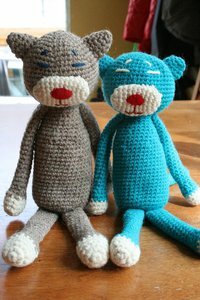 Thuy went on a bit of an amineko crocheting bender about, oh, 5 years ago, and she sent me a couple of unassembled amineko to animate. Well, the production line got a little stopped up, obviously, because it has taken me that 5 years to finally put these little guys together. 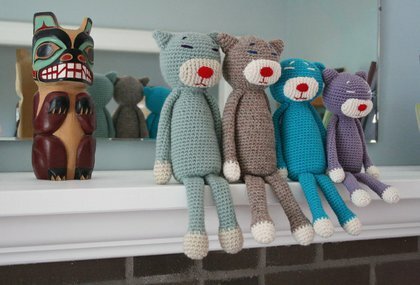 The new amineko are the two in the center (Thuy thinks the turquoise one looks like my brother). Here are the new guys. I have to say I haven’t tired of these amineko. They are so darn cute! 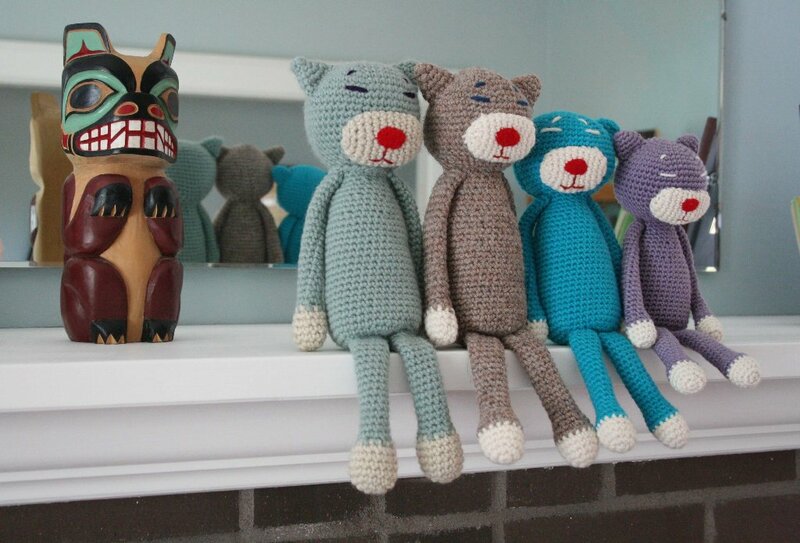 Now I kind of want a whole houseful of them, but I think I have forgotten how to crochet them. Oops. it totally looks like sashi!! i love those silly dolls!!! They are great! You’re reminding me that I have that book here somewhere; it’s been hanging around for well, um, 5 years!!! Oh, amineko! I love those cats! I made one about 5 years ago, too. I’ve been wanting to make more, but haven’t got around to it. You know, that’s how I first found your blog back then. I had bought the book in Tokyo, and came home searching the internet for info about them and came across yours and Thuy’s blogs. They look so cute together. I’ve been crocheting things like potholders, so I would love to make something different. These or something like them sound like just the ticket!